Golden Goose PR client and TV presenter Jasmine Harman is embarking on a chilly expedition to raise awareness for Dogs Trust. Normally on the look-out for hot properties on tropical shores, this will be a very different mission. Armed with a large coat and team of Alaskan huskies, Jasmine will travel 180km through Sweden by sled in just five days. Temperatures average -28 degrees and she will be just 200 miles north of the Arctic Circle! To help drum up some last minute sponsorship, Jasmine and Golden Goose PR joined forces to host a pooch themed quiz at The Roundhouse in Wandsworth. Forty eager dog lovers battled it out for prizes and were entertained by Shadow, the Bernese Mountain dog and love of Jasmine’s life. Jasmine raised £500 during the evening bringing her even closer to her target of £2,500. This will help the Dog’s Trust to rescue and re-home unwanted, abandoned and stray dogs. 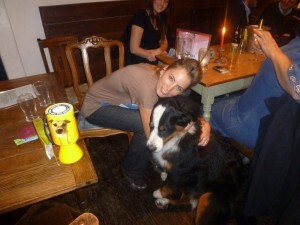 Please do visit www.justgiving.com/JasmineHarman to find out more about Jasmine’s Arctic trek!